Be strict on holding your lower (nafsani) desires. Make a firm determination. Do not yield to these sinful desires easily. These desires and Satan are our two arch enemies. 2. Change the thought pattern. The mind is constantly occupied with thoughts. There is no gap or vacuum in this process. These thoughts are either of worldly matters or useless issues or sinful activities. It is essential to intervene and develop a spiritually healthy though pattern. We have to actively think about hereafter, heavens, thankfulness of Allah for the innumerable bounties and blessings bestowed upon us, asking refuge for anticipated calamities, repenting from sinful activities, etc. This is the most effective way to achieve the change of thought pattern. It leads to absorption, assimilation and implementation of the Divine teachings in our life. Without the company of the the pious the Deen remains limited to superficial level. Set up a daily routine of making remembrance of Allah. There are three categories of remembrance of Allah. First is that it is done with the tongue without presence of mind. Second is when tongue is silent and there is mindfulness. Finally, when both tongue and mind are making the remembrance together. Do not under evaluate even the first category. It is a stepping stone for the rest of the categories. Moreover, with consistency it eventually engulfs the mind also. Make a daily time table for this. The daily activities done in an organised method creates barakah in time. More things are done in the same period of time. Include in it these four things, recitation of Holy Quran atleast two pages daily, durood, third kalima and istegfar. Fix a specific time for them. 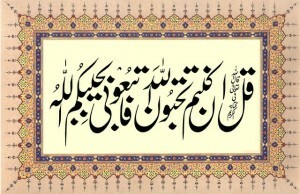 In other times recite whatever form of remembrance comes to mind. The remembrance of Allah (dhikr) is a form of energy and power. It assists in development of determination to fight the lower desires. Set a specific time for this. Like prior to sleeping, after esha. For few minutes sit and supplicate. Make this supplication daily without any gap. It is impossible that Allah will reject this supplication indeed. 29th Ramadan 1432/30th August 2011, Darul Uloom masjid, after duhur bayan. This entry was posted in B. Praise worthy morals, C. Blame worthy Morals, D. Acts of Worship, F. Zikir & fikr, N. Advice, S. Sunna, T. Tarbiyet, W. Wird & wazaif on September 17, 2011 by 'abd.